We have guided you to cleanse your being and aura. Now We will look closer at chakra health and openness. Your entire being is a symphony of energy. Darkness and barriers interfere with the health of your energy field. To open and heal the chakras, you must begin at the bottom and work your way up. To be in alignment with the Universe you must be connected to Mother Earth and God. 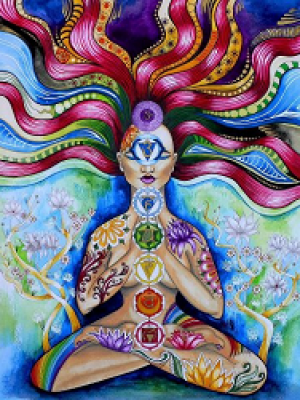 Once you have opened and healed your chakras you will need to allow fluidity between your energy being, God above and Mother Earth below. It is a circuit of relatable energy which will replenish your health and provide you with a symbiotic relationship with the Universe. You are not an island. You never were. You are a particle of God and the Universe. You may not currently feel this intimate relationship but this is because you have shut down some portion or all of your own connectedness. You have singled yourself out. This may have occurred at any time in life. You likely shut down, felt ill or over-extended and closed in upon yourself as a means of coping. You felt that if you were no longer receptive to information outside of yourself you would have a better chance of managing your life and all of your stressors. You may still do this despite your obvious need to learn, evolve and prosper. What We are doing in these lessons is reopening all of your energy to the best and highest energy of the Universe. The more you open the more successful you feel. Your life seems charmed and you want for nothing. We have also taught you to protect yourself against any dark or negative energy. To be open means to be protected. You must not forget any of Our teachings for they all work in concert. This openness to God and your Higher Purpose is a process. We cannot teach you all of it in one sitting. Now that We have come this far We must encourage you to open your entire being. You continue to have a habit of neglecting your back, the top of your head, the bottom of your feet, both right and left hemispheres and all of the inner spaces between bone, tissue and fluid. Then, you neglect to extend your healing beyond your physical self. This is OK. We understand that there is a lot to remember. The chakra waterfall is a cleansing exercise to stay open and cleansed. Envision yourself sitting under a waterfall. Make sure you are comfortably seated or in any position you prefer. Connect your tailbone to the center of the Earth with a green cord and a white cord from your crown to God. Envision the waterfall flowing through you. This is your entire being including your aura. Crystal clear, sparkling water is a good start. Keep it flowing for as long as you wish. Stop the waterfall when you feel fully refreshed and in connection with All There Is. You do have to close up a small amount in order function properly in the deeply stagnant energy of Earth. Being completely open would leave you exhausted and vulnerable. Envision a light coating of your physical body but do not coat your aura. Be sure there is no darkness, blocks or barriers. You have worked hard and done well. Be secure in this open, enlightened state. Release any fear that you are vulnerable to dark energy. In this state of being cleansed, cleared and in connection with God and Mother Earth, you are well protected. Do not allow fear to keep you from God. Relax and be still. Become content and at peace. You have much to learn and in this blissful state you will make the most progress. Ask for your spirit guides, angels and God to circle you with love, healing and protection. Do your best to feel this embrace. No harm will come to you when you are fully connected to God and surrounded by your guides and angels. Much will be done in this perfect state. Our love for you is palpable. Let Us fulfill Our agreement to bring you to the presence of God. This is Our honor.